On March 9 1983 the Flemish satirical weekly De Zwijger (English: The silent one) invited several comic authors for a tribute to Hergé who had passed away the week before on March 3. For the occasion De Zwijger invited such comic authors as Theo van den Boogaard, Luc Zeebroek (which is another nickname for Kamagurka), Jan, Kamagurka, Mark Smeets, Quirit, Luk Vandevijver, Zak, Dirk Stallaert, Evermeulen, Gal, Marc Sleen, Zak and also Bob De Moor. Good to know, Theo van den Boogaard worked out a 4 page story with Quick & Flupke based on drawings by Hergé. Where is Bob De Moor? But back to Bob De Moor. Strangely enough he wasn’t mentioned on the front of the issue as you can see on the left although a tribute was published on page 7. It must have been an odd reason because most of the other comic authors don’t really play in the same league as Bob De Moor. While we await our copy to arrive to give you a proper scan, we already were sent a first tiny picture, which we have used today. 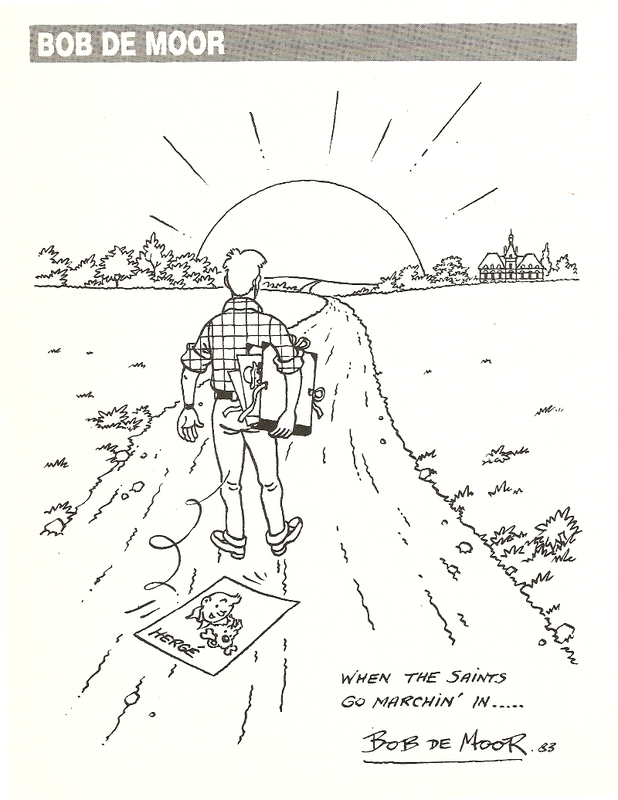 The drawing sees Hergé walking away towards the sun with the Marlinspike Hall (French: Le château de Moulinsart) on the right. A drawing falls out of his art folder, that of Tintin and Snowy. Below on the right you see the sentence “When the Saints Go Marchin’ In…” taken from an American gospel hymn. First recorded on May 13, 1938 by jazz musician Louis Armstrong and his Orchestra, the hymn itself expresses the wish to go to Heaven, picturing the saints going in through the Pearly Gates. For that reason it is entirely appropriate for funerals. We have asked the family De Moor to have an insight in the music collection of Bob De Moor and we are pretty sure that the version by Louis Armstrong can be found in there. Unless it’s the version which Elvis Presley recorded… we’ll update this story when we know more! Some more info on the weekly De Zwijger, because there’s an extra link with the family De Moor. It was launched in 1982 by journalist and publicist Johan Anthierens and Herman van Hove. That very Johan Anthierens would later on translate several Johan De Moor albums into Dutch in a way that no other translator ever succeeded in doing. The weekly would file for bankruptcy in 1984 after it had published a critical article on Roularta. Bad luck because that publisher happened to be a business partner of the publisher Biblo, which edited… De Zwijger. The move resulted in a loss of sponsors. Add to this the massive workload for Anthierens and the recipe for failure was created. Even though the publisher Kritak accepted to release it after they were dropped from Biblio, it was too late for the weekly which stopped being published in June 1984. The end also meant the end of a Flemish magazine in the style of Le Canard enchaîné or Charlie Hebdo. Below is the version by Louis Armstrong. Is this the real precursor to the Flemish trilogy? If you thought that Bob De Moor‘s finest medieval work had to wait till he was to create his Flemish trilogy for Tintin then you will reconsider this thought after reading this article, and especially after having seen the illustration we will present today. The first thing you need to realize when talking about Bob De Moor‘s early work is that he had to work under a lot of stress. 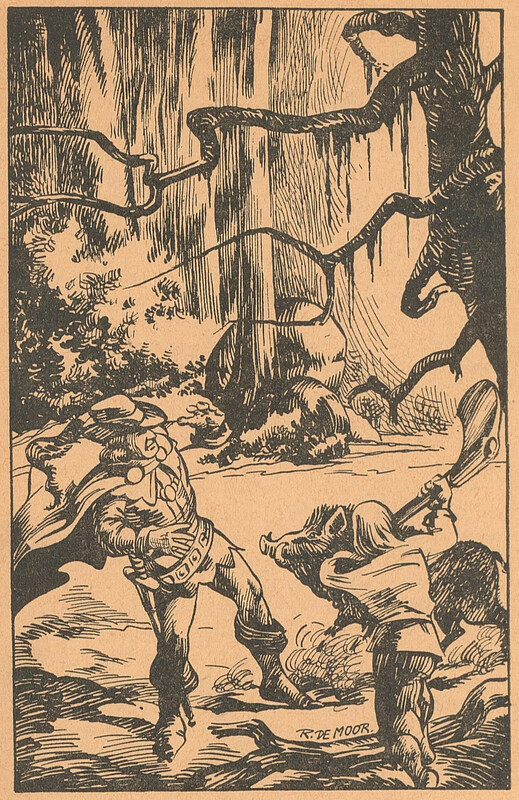 During his early years as a professional comic author he had to provide an income for his young family which resulted in him working on up to 7 different series at the same time. 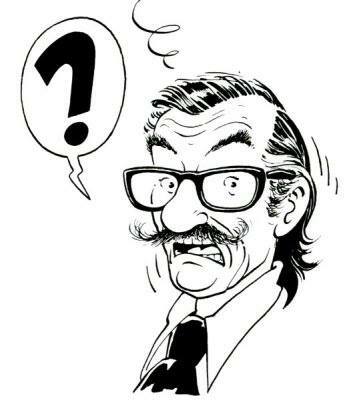 That of course had an influence on the quality of his work (even though the quality stayed ahead of many other comic authors working at that same time). 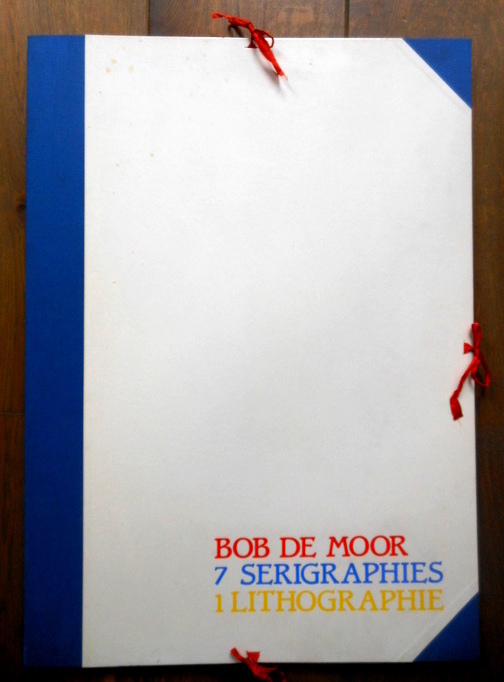 The drawing we present you today dates from 1946 and shows the big talent Bob De Moor had for realistic drawings too. 1 of the 7 drawings by Bob De Moor in the book. It was again Chris Mouton who provided us with this little pearl. 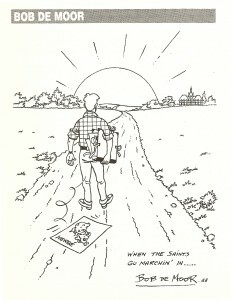 The drawing was published in the 1946 book “De harde tocht” published by the Bruges based editor De Kinkhoren as part of their ‘Schild en vriend’ collection. It is actually a Dutch (in the old spelling) translation (by Frans Van Boogaerdt) of the 1938 book “Mission Périlleuse” which was written by the Belgian French speaking monk/priest A. Hublet. The drawing style reminds of that one which De Moor would use 4 years later for “Sterke Jan” for instance. Note also that it looks very much like it that De Moor mimicked a print made from an engraved plate here, something he would only use in a few other stories later on (Cori for instance). 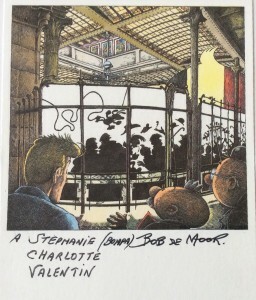 The style, which is way ahead of some of his other work produced at the same time or even a year later for instance, shows very much that Bob De Moor needed the more stable environment of the Studio Hergé later on to deliver some more masterpieces. 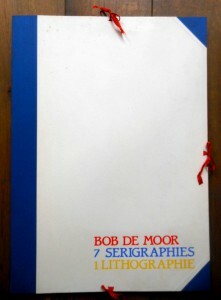 The 192 page counting book has 7 illustrations by Bob De Moor (signed with ‘R. De Moor’). The story itself is placed in the middle ages and talks about a knight looking for the ‘Easter flower’ (‘Paaschbloem’ as it says in the translation). Located in the heart of Brussels, in a beautiful Art Nouveau building, created by Victor Horta in 1906, is the Belgian Comic Strip Center. It opened its doors to the public on October 6th 1989, 5 years after the non-profit organization “Belgian Comic Strip Center” was created in 1984. The Belgian Comic Strip Center’s presidents have been, in chronological order, Bob De Moor (1984-1992), Jean Van Hamme (1992-2000), Guy Dessicy (2000-2012), and the current president Ferry Van Vosselen. 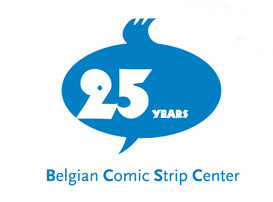 This year the Belgian Comic Strip Center celebrates its 25th anniversary (and it’s 30th if you count from the creation of the non-profit organization). Over the years many comic authors have paid tribute to this museum, not in the least Bob De Moor who had a part of the Barelli album “Barelli in bubbly Brussels” taking place at the museum. He also created the drawing on the left which was very much unlike his normal work but which clearly shows the versatile craftsman he was. The scan we offer on the left comes from the documentation of the family De Meulenaere – De Moor and shows a 11.5cm X 17cm postcard of the original drawing which Bob De Moor dedicated to 3 of his grandchildren and signed as ‘(Bompa) Bob De Moor’. For the non-Dutch speaking, ‘bompa’ is the flemish word for the more cosy ‘grandpa’. In the drawing you see Barelli, Balthazar and Monsieur Tric watching the opening party that takes place at the Belgian Comic Strip Center. You will recognize from left to right: Blake & Mortimer, Marsipulami, Lucky Luke, Tintin, Captain Haddock, Snowy, La Castafiore, Thompson and Thompson, Spike and Suzy (plus her doll Muffin), Gaston and his favorite music instrument the Gaffophone. A bigger format of the drawing was featured in “Le 9ème Art entre dans l’Art Nouveau – T.1” together with work from Andreas, Franck Pé, Vance and Yslaire. The item was published in 1989 by the Belgian Comic Strip Center and held serigraphs by said authors. Note that the 25th Anniversary Celebrations for the museum will be on 4 and 5 October 2014 for the general public. A special invitation only event is scheduled on 3 October. For those interested to dive some into the less well known publications on the Franco-Belge comic scene, we recommend a visit to the library which harbors some really old and rare books! 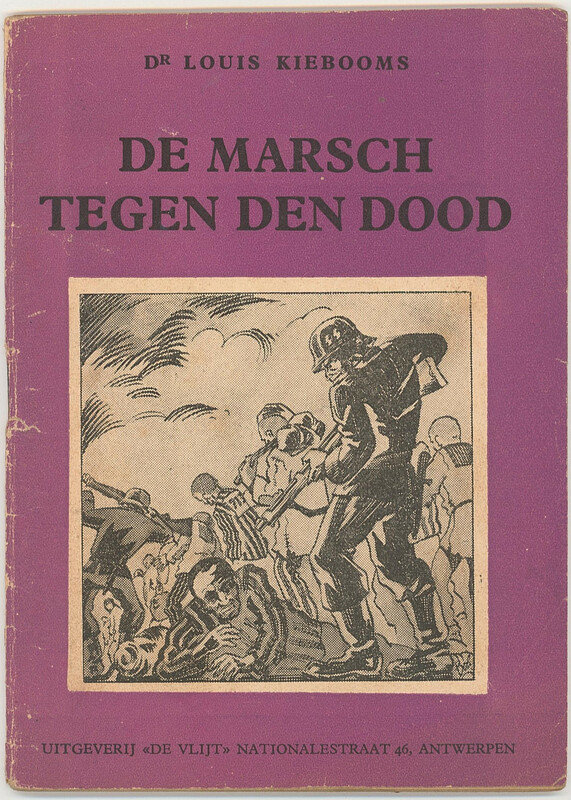 In 1945, the Antwerp based publisher De Vlijt published a book, “De Marsch tegen den dood” (“The march against the death” in English) by a certain Louis Kiebooms aka Louis Auguste Kiebooms (1903 – 1992). He was a Belgian member of parliament and mayor of the city of Wilrijk (Antwerp) between 1947 – 1953 and between 1958 – 1964, but he was also a victim of the Nazi terror in Belgium. And that’s what the book “De Marsch tegen den dood” talks about. 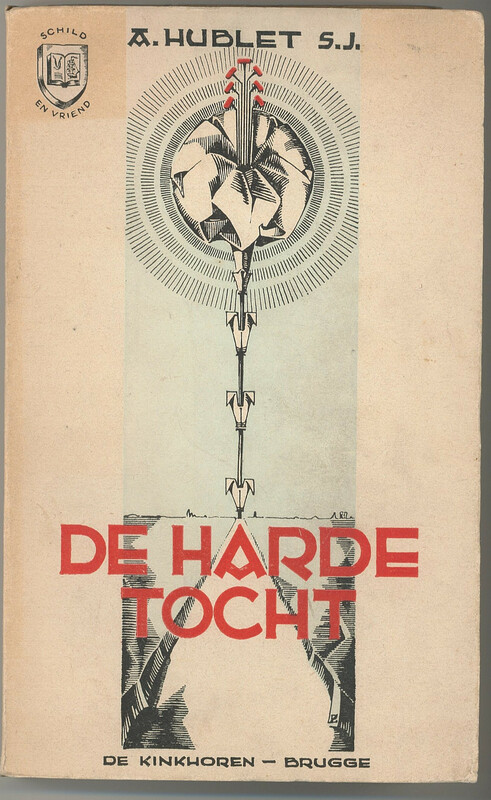 The cover of “De Marsch tegen den dood” was by the then 20 year old Bob De Moor, you can see his ‘Bob’ signature in the right bottom corner of the cover. 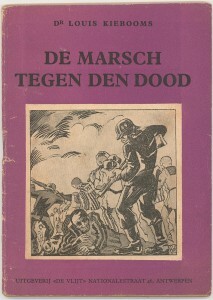 “De Marsch tegen den dood” by Louis Kiebooms (1945). 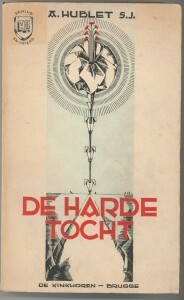 Cover by Bob De Moor. Bob De Moor shows the prisoners during the so called ‘march of death’ (In Germany they talk about the Todesmarsch) which started on April 11 when the concentration camp at Sachsenhausen was evacuated and lasted till May 3rd and May 6th when they were finally rescued by soldiers of the 2nd Belorussian Front in Crivitz and Raben-Steinfeld near Schwerin and by American troops of the 7th U.S. Tank Division near Ludwigslust. The march – which had 33.000 prisoners from the camp, including women and children, walking between 20 and 40 kilometers a day in cold wet weather and slept outdoors – had cost the lives of 7.000 people. During the march they were mistreated by the SS guards. That specific aspect was also the subject for the drawing Bob De Moor made for this book. More precisely he chose to put the scene between the abusive SS guard on the right and the exhausted prisoner laying down in the forefront, giving the whole an extra dramatic effect. On top, the story itself was more than authentic as Louis Kiebooms, the writer of the book, was one of those prisoners who survived that march. He had been sent to the Sachsenhausen camp in 1941. When returned to Antwerp in 1945, he chose for a political life. Thanks to Chris Mouton for this little treasure! There are a lot of Bob De Moor serigraphs available online, some are genuine but a lot are actually counterfeits. But one which surely is genuine is the one currently on auction on Catawiki (where it has already reached € 400 605). It’s a folder holding a set of 7 serigraphs plus 1 lithograph by Bob De Moor. Originally published in 1985 by the Brussels based Les Editions Ligne Claire this rare item was released on 109 copies only (including 24 copies which never reached the market). The one auctioned right now is one of the 85 ‘normal’ editions. Over the years some of the included serigraphs have been auctioned separately, not because the folders were cut into parts, but because 6 of the serigraphs plus the lithograph were published in various series holding 1 to 4 serigraphs on 150 copies: 4 serigraps (86/150 to 150/150), 1 serigraph and 1 lithograph (86/101 to 101/101), 1 serigraph (86/124 to 124/124). The folder (and prints) measure 50 x 70 cm and all the prints are in color except for the Monsieur Tric and the Cori drawing ‘Ecole de Navigation’. The latter is a pencil reproduction. In 1988 Guy Delcourt Productions released the album “Les Belles Histoires d’Onc’ Renaud Volume 2 – Le retour de la bande à Renaud”. The album, just like the 1st volume from 1986, was a comic tribute to Renaud Pierre Manuel Séchan, known as Renaud, a popular French singer, songwriter and actor. Before you say ‘Who?’, know that with the exception of a recording of “Miss Maggie” in English and a ‘franglais’ recording of “It is not because you are”, his work is almost unknown outside the French-speaking world. The participating comic authors for this 2nd volume were Arno & Bocquet, Arno & Bocquet, Boucq, Cabanes, Bob De Moor, Philippe Berthet & Dominique David, Jean-Claude Denis, Geerts Jano, Liberatore Lidwine, Loisel & Miltidjan, Plessix & Dieter, Ptiluc, Tome et Janry, Tripp, Tronchet, Ben Radis and Uderzo (who made the cover artwork for this 2nd volume). 10 of these artists chose to go for a comic story approach based on a song by Renaud while Bob De Moor went for an illustration instead just like Lidwine, Jano, Tripp, Boucq, Ben Radis and Liberatore. 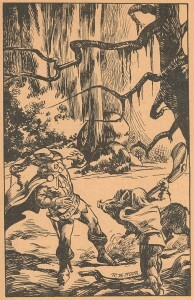 De Moor’s illustration was put on the last page holding the publication info. You’ll notice that Bob De Moor went for a Pied Piper of Hamelin (aka the Rat-Catcher of Hamelin) approach with Cori acting as the Pied Piper of Hamelin and Renaud as his aid on guitar. In the young public lured by their music you’ll also discover Barelli dancing with Anne Nannah, Balthazar doing his usual ‘dance’ move and Monsieur Tric in a rather not so typical posture (watch the legs) and costume (Fred Astaire comes to mind). On the t-shirt of Anne Nannah and 3 of the kids Bob De Moor added the titles of 4 songs by Renaud: “Jonathan” (actually a song dedicated to Johnny Clegg), “Miss Maggie”, “Ma Gonzesse” and “Marche à l’ombre” (an album dedicated to the french criminal Paul Toul). Bob De Moor often listened to French ‘variété’ aka music hall music and it’s not unthinkable that Renaud was part of his personal selection. Also the following names probably were part of this: Michel Berger, France Gall, Bernard Lavilliers, Véronique Sanson, Gérard Lenorman, Michel Jonasz, Alain Souchon, Francis Cabrel, William Sheller, Yvan Dautin, Pierre Bachelet, Francis Lalanne,Jacques Higelin, Hubert-Félix Thiéfaine, Téléphone etc.. Unlike most of the other Bob De Moor illustration, you can still find this one at a very moderate price right here on Amazon France . The album holds both sold out volumes and is more than worth getting.